YouTube is removing videos for JustBeenPaid, a “program’ linked to Frederick Mann and popularized by scammers on Ponzi boards such as TalkGold and MoneyMakerGroup. JustBeenPaid promos feature claims of remarkable returns. 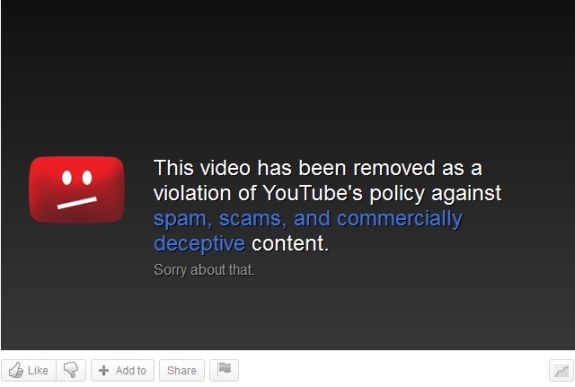 The removed videos carry messages such as “This video has been removed as a violation of YouTube’s policy against spam, scams, and commercially deceptive content” and “This video is no longer available because the YouTube account associated with this video has been terminated.” Some JustBeenPaid videos remain on the popular video site. It was unclear if YouTube plans to remove all of them. JustBeenPaid appears to feed itself through a “program” called JSS Tripler and also appears to be tied to something called Synergy Surf. The program, which is foundering, became a Ponzi darling in the days after Club Asteria slashed payouts and then suspended them altogether earlier this year. Ponzi forum posts identity Mann as the JustBeenPaid braintrust. Just last month, an image of actor Will Smith was featured in a Club Asteria promo. The image was removed after the PP Blog contacted Smith’s publicist. It is common for fraud schemes to trade on the names of celebrities and to plant the seed that celebrities endorse a specific program when no such endorsement exists. One apparent Just Been Paid fan on MoneyMaker Group suggested his control over hundreds of YouTube accounts would enable him to circumvent any ban YouTube enacts against Just Been Paid. “No sweat, I own over 500 Youtube accounts, so I’ll just keep making videos like normal, plus I can always use Viddler and Windows movie maker and facebook video as well,” MoneyMakerGroup poster “gtprosperity” claimed. It’s fruit-cake – tax denier – evilgovernment nonsense. Just what a ponzi player/operator would be in to. It’s the group anonymous hitting this scam. YouTube has nothing to do with this. They just approved reports we sent. And we’ll keep watching. All new videos will be removed after a week or so. And all we need is first 3 or so pages of results down to show people that this is scam. “gtprosperity” wouldn’t happen to be Alan Glen Todd, one of the heads of the 2010 Blessings cash gifting fraud, would it? The scheme that I characterized as “massive money laundering” after one member sent out boasts to his mailing list that, if true, would have meant over $4 billion US dollars had passed through their “tax free gifting” system in the final four months of 2009 alone. Yes, it does appear to be. Glen.todd58@gmail.com was his contact email at MMG, which matches up with my2010blessings4you@gmail.com, glensglobalnpnbiz@gmail.com, alantoddwins@yahoo.com, gtprofitforce@gmail.com, glenspath2wealth@gmail.com and glenssupreme2x2team@gmail.com, among numerous others that this Ohio huckster has used in his unending quest for a fast buck. On Nov. 5, 2009, he had these to say in two emails to a goblin of my acquaintance who was gathering information on 2010 Blessings and had chastised him for his tax fraud. I hate to burst your bubble, but 2010 Blessings is NOT a pyramid scheme, scam or illegal whatsoever. We are a community that truly cares about helping others. Most everyone that is involved with 2010 has received cash gifts, the ones that haven’t will be very soon. Most people don’t even have to spend any money out of there own pocket. We use the pay-it-forward concept. there is no top individual that receives any money. I have already spoken to 3 lawyers that are well versed in cash gifting and they all concur that there’s nothing illegal about this whatsoever. Several charitable organizations are benefiting from our efforts. I have no idea what prompted you to send this, but I’m wondering if maybe you were involved in some type of cash gifting activity and didn’t receive any cash gifts or maybe you’re involved in some type of MLM and you’re afraid that you’ll start to lose your downline to 2010 Blessings, because of the fact that it REALLY does work. I do appreciate your concern though. Thank you and may you be blessed. And part of the second email. I don’t know who you are, nor do I really care. What I do know is that you are continuing to spam me with this. and as far you contacting my local police department, Buddy, they know who the hell I am and what I do for a living. Actually what was really funny is the guy who supposed to be doing the second phase of the restart could not get the programming done as he had to play Mr. Mom. No I am not kidding. When someone asked what had to be done to get him back to doing his “Job,” they said hire him a baby sitter. Now that was not only true, but funny. This is becoming more like a sitcom comedy every week now. But have to admit that is the first time I have heard the scammers excuse they had to be Mr. Mom for the delay in paying. But all is well, or so they claim, as he is now back working on the programming to finish up the second part of the restart. They might get lucky and get it done by Halloween at the rate they are going. Come to think of it, that might be a good date for them to do it as it is going to be more trick than treat. You just don’t get it do you? Yes every HYIP (High Yield Investment Program) will become a scam later, but that doesn’t mean they are all ponzis. For example, you can only sign up 2 levels under someone and your positions don’t get placed under everyone. They get placed strategically. I know, they will scam sooner or later, but give some of these programs some slack. I am 200% in profit with Just Been Paid and am still making money without referring anyone. Just because you are still stealing money with JustStoleMoney, doesn’t make it even remotely legit. Just Been Paid: You just don’t get it do you? Actually, yes, I do. One of the things I “get” is that you created the username “Just Been Paid” here despite the fact the “program” makes people affirm they aren’t government spies or media lackeys, recently announced an “offshore” server plan — and all while BigBooster.com tries to plant the seed that Buffett is on board and JustBeenPaid.com tries to plant the seed that Oprah is on board. Beyond that, I also “get” that it’s somewhat common for members of “programs” to come to this Blog to defend obvious Ponzi and fraud schemes. Just Been Paid: Yes every HYIP (High Yield Investment Program) will become a scam later, but that doesn’t mean they are all ponzis. For example, you can only sign up 2 levels under someone and your positions don’t get placed under everyone. They get placed strategically. Good grief. Just Been Paid is insisting members affirm they aren’t government spies or media lackeys. That’s straight from the Legisi playbook — before the charges were filed, of course. But you’re OK with that? It doesn’t strike you as over-the-top and just plain bizarre? That one can only sign up “2 levels under someone” is a vacuous claim — like saying Just Been Paid can’t be a Ponzi because Tuesday only comes once a week. The number of levels is immaterial. What is material is the confluence of payment schemes — matrix payouts and sponsors’ commissions (or the mix and match of these) — and where the money comes from to fund those payments. Not only is Just Been Paid a Ponzi, it is one that is mixing in money from other Ponzis. The Ponzi-board promoters did what they always do: Fanned the flames for Just Been Paid while pushing multiple Ponzi and fraud schemes, meaning the Just Been Paid proceeds are mixed with proceeds from other fraud schemes. That’s per se fraud, before the Ponzi elements even are considered. Throw in the “offshore” jazz and the various strange explanations and downtime, and a story very similar to ASD emerges. Just Been PaidI am 200% in profit with Just Been Paid and am still making money without referring anyone. That you are in “profit” hardly means that Just Been Paid is not a Ponzi scheme. Just Been Paid: You just don’t get it do you? Yes every HYIP (High Yield Investment Program) will become a scam later, but that doesn’t mean they are all ponzis. For example, you can only sign up 2 levels under someone and your positions don’t get placed under everyone. They get placed strategically. I know, they will scam sooner or later, but give some of these programs some slack. I am 200% in profit with Just Been Paid and am still making money without referring anyone. Let me get this straight. You KNOW it will be a scam later. You KNOW you are up $200. How can you not KNOW you’re in possession of stolen funds? Since you all know so much about Just been paid. Here is a quick question for you, have you ever looked at the FAQ’s or gone to the web conferences that are available to everyone even if you haven’t become a member? Or have you called the conference call that is available to everyone every week, where you can talk directly to Frederick Mann? All I am saying is that if you are going to make these claims you should check out all the information first. You may be surprised at what you find. z-man: Here is a quick question for you, have you ever looked at the FAQ’s or gone to the web conferences that are available to everyone even if you haven’t become a member? and what good would that do ??? I don’t know how it works where you live, but in my world, fraudsters make a point of telling lies about what they’re up to. If they told the truth, it wouldn’t be “fraud” would it ?? And yet you’ve failed to address one fact that would be allegedly untrue. Guess you got in too late too huh? lol. brings up a number of publications that would suggest that Mr. Mann, if he is indeed the same person, has a long history of anti-government preaching and tax protester activity in America. If “Frederick Mann” and “David T. Freeman” are in fact one and the same, than he has a criminal record and history of parole violations as well, unrelated to taxation and anti-governmental activities. “The Advertising Module of JSS will be implemented within a few days. This is a message that has been displayed on justbeenpaid’s JSS since it launched when you try to use their “product” of “advertising”. A few days has been nearly a year and counting. I don’t care no matter what other says about JBP. The only one thing I do care is whether I’m actually making money or not and I’d say I’ve been making money since october in 2011. I can’t believe the idiocy of the poster and others who are so quick to call JBP a scam. Obviously they know nothing about the inner workings of the program. If JBP is a acam, then the stock market is a scam…and for that matter the whole government…because they work on the same principle. Next time do your homework a little better. As for advertisments, I know little about them and could care less, The important thing is that my money earns money. IT WARMS THE COCKLES OF MY HEART THAT YOU PRO PONZI/HYIP/MATRIX CYCLERS SHOULD POST HERE AND LEAVE YOUR FOOTS AS A CRIMINAL. I LOVE IT….. WAIT FOR THE KNOCK ON THE DOOR! THE GOOD SIDE CROOKS VOLUNTEER TO COMMIT SUICIDE BEHIND BARS! PLEASE SEND YOUR PRISON OF CHOICE… WE WILL SEND GIFT PACKAGES OF STERILE 1/2″ NYLON ROPE! HANG DOWN YOUR HEAD TOM DOOLEY (SCAMMER) HANG DOWN YOUR HEAD AND CRY! POOR STUPID CRIMINAL BOY YOU ARE BOUND TO DIE!